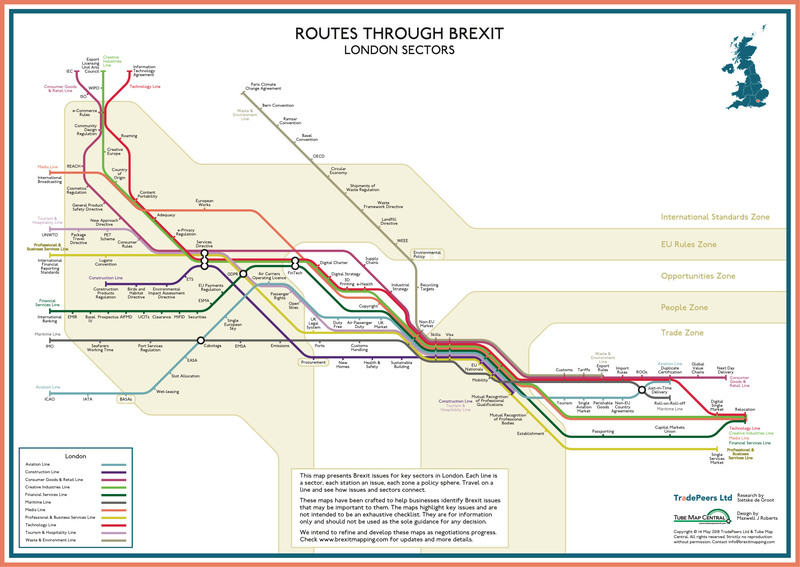 designs are fully credited to TradePeers Ltd and Tube Map Central and another example of their beautiful maps in featured at the bottom of this article, www.brexitmapping.com. Brexit news and reports have been occurring now for almost three years. The issue only becomes more complicated and ambiguous as decisions are delayed and more possible outcomes are on the table. After pushing the exit date back another two weeks to April 12th, a deal has still not been made and some members of parliament are willing to settle with a mediocre deal, which they consider better than no deal at all. With a no deal Brexit the UK would leave the EU creating many uncertainties over residency, trade, fresh produce, and a continuous supply of medicine. 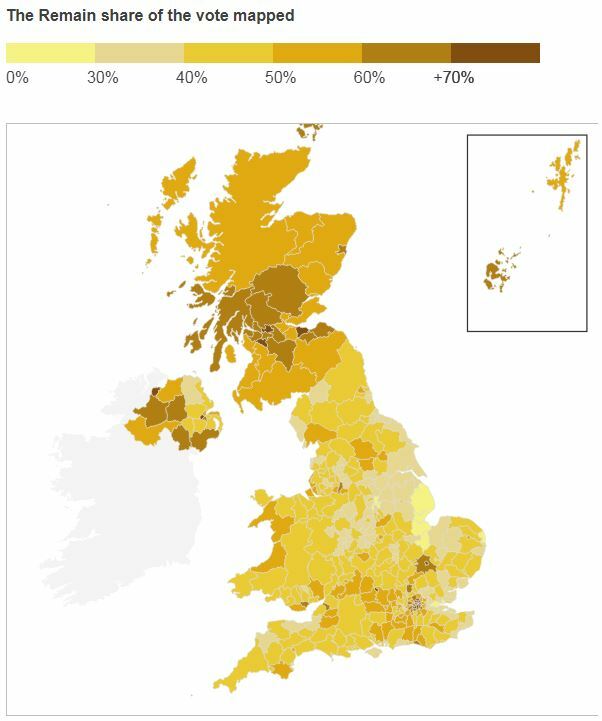 This map depicts important issues for businesses that will arise from Brexit. Each issue is a station, an industry sector is a line, and the zones are wider company policy categories. While this shows a map of London, the team behind it has created many others for various regions around Great Britain. Brexit’s break from the EU has much larger implications. Whether businesses realize it or not, there will be unprecedented results. If not properly prepared, the potential for economic damage could be devastating or opportunities could be missed. The creators of this collection of maps are Sietske de Groot and Dr. Maxwell Roberts. De Groot is an EU specialist and business consultant with experience helping companies adjust to new policies, regulations, and markets. Dr. Roberts is a psychologist who teaches at the University of Essex, focusing on human intelligence and information design. He investigates the tube map design with the aim of making them more comprehensible. Max Roberts’ work has also featured in the NACIS Atlas of Design. 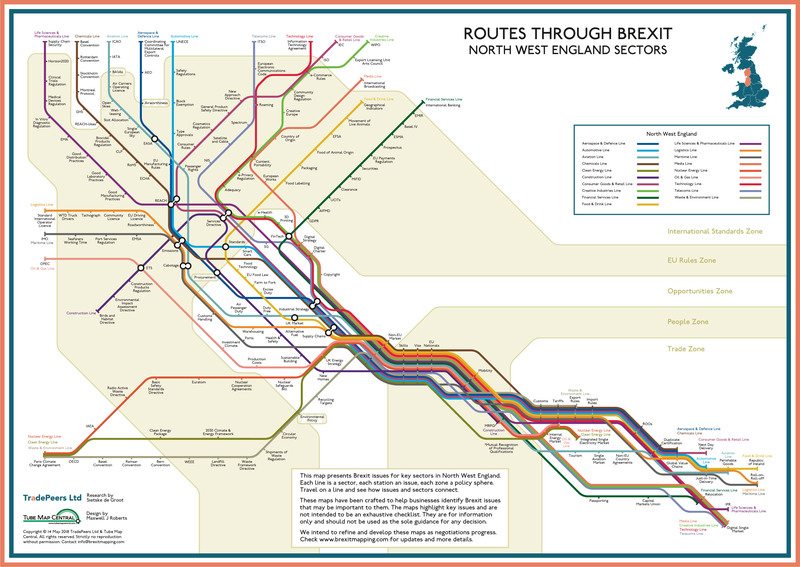 The two are selling unique maps that highlight particular issues on the UK’s most predominate sectors and industries. Their goal was to make it easier for businesses to begin thinking about how Brexit will affect them. The list is not all-encompassing, but it does a great job of visualizing complex issues. Let’s take a look at some of the stations that connect on the different lines. The map breaks everything down into simple pieces. For example, take the Tourism and Hospitality line. First, this line plays a more predominant role in London than in other sectors of the UK. Each line is dependent on others so it’s no surprise how many issues Tourism and Hospitality share with the Aviation line. Some connections are easy to make. Look at the maritime and aviation lines, grey and light blue respectively. They intersect at Cabotage, which is defined by Oxford Dictionary as the “the right to operate sea, air, or other transport services within a particular territory.” While it may look like one small area that doesn’t intersect with anything else, the halted movement of transport services could be fatal to the UK. According to the Observatory of Economic Complexity (OEC) the UK is the 11th largest exporter in the world and 5th largest importer in the world. It may seem like an outlier, but it is of vital importance for the future of the UK’s economic health. Look at the dark green, light green, and red lines which are financial services, creative industries, and technology, respectively. They all connect at financial technology or fintech. Each rely heavily on fintech markets and even if only one is hurt, the others will feel the ripple effects. A no deal Brexit is becoming more of a reality and fintech companies need to prepare before the normally streamlined procedures between the UK and other European nations become cut off. In other words, the fintech market in the UK is larger due to being part of the EU, but Brexit will surely hurt it. The Brexit vote was incredibly close. With a turnout of 72% of the population, 51.9% voted to leave and 48.1% to stay. With a vote this close, there must be a better understanding of the crucial issues at hand, and three years after the vote a plan has not been executed. An action such as leaving the EU is, at the very least, complex and controversial. Shouldn’t there be more straightforward, visual resources, such as this collection of maps, to explain to the public how they could be affected by what is to come?